Since the history of NNU, it has paid out millions of Naira to their participants including myself. 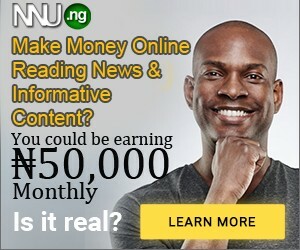 NNU is the only program that let you make money online just by reading news, commenting and sharing news updates. This is something everyone is doing daily even without being paid to do so, but with the NNU income program, you stand a chance to getting paid for every activity you are carrying out within the site. So why not give it a trial? Huh? Sharing of sponsored posts (Everyday, NNU release one sponsored post, you can share this post on your Facebook timeline then after approval, you get paid for the activity) This must be a joke, Matty, Lol, I said it is true oga… What’s wrong with you sef.. Lol.